The Native American story of Black Kettle's Village. Learn about the culture, stories, and legends of American Indians and their famous chiefs, tribes and wars. A Native American Story of Black Kettle's Village to teach kids about Native Indians in a short, enjoyable, easy to read format. The Peace Commission held a meeting in Chicago in October. 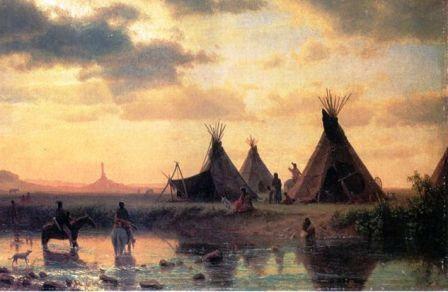 It decided that the plains Indians should not be permitted to travel beyond their reservations without written leave. There were the eight hundred troopers, in various forms of attire, buffalo overshoes, buffalo caps, buffalo mittens, scarfs about their heads—anything to keep them warm. The sun was low when finally they found the trail—the Indians' trail, and the trail of Major Elliot's column, beside it. "These Osages are gettin' skeered," Californi a Joe asserted. 'Tain't their kind o' campaign—this hyar marchin' by night an' not knowin' whar you're goin'. Guess they smell spooks." 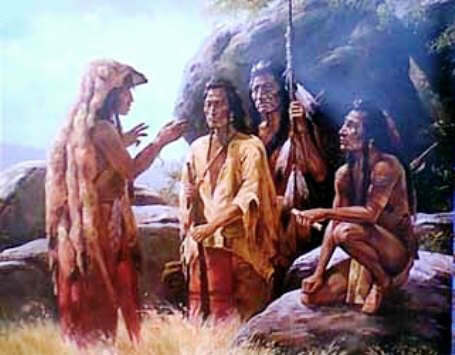 The Osages were in solemn council, sitting in a circle. They had not much hope of victory. The white chief with the yellow hair might fail in his surprise; he was out-numbered; the village looked strong. They feared that to save himself he would trade them off—he would surrender them to the Cheyennes. Ugh! It was the marching tune and battle tune of the Seventh Cavalry—had been the marching tune and battle tune of the Custer Third Division in the Civil War. The notes rent the stillness. Cheers answered like echoes—the Colonel Thompson column and the Major Elliot column and the Colonel Myers column had heard, and were charging. Captain Alfred Barnitz of Ohio killed two Indians and was shot through the body. For this he was brevetted colonel. The village indeed battled stoutly. Black Kettle was dead—killed at the door of his lodge, in same manner that Iron Shirt the Kiowa-Apache had been killed in the Kit Carson men's charge at Adobe Walls. Koom-la-manche the Osage took his scalp. Black Kettle's wife was killed, fighting by his side. Boy Black Kettle fell. He had mounted his pony-revolver in hand had charged Captain Fred Benteen had refused to surrender and had charged firing—had killed Captain Benteen's horse and was about to kill the captain also. Then he had died like the son of a great chief. The death songs were rising—women were shrieking, children crying, soldiers cheering. The Osages found the squaws running for shelter; rounded them up with switches and herded them back into the village. They wailed, and the warriors knew that a great blow had befallen them. General Custer saw warriors gathering upon a hill below the village. He examined them through his glass. They were mounted, they were armed and fresh and wore war bonnets. This puzzled him. California Joe had driven the pony herd in—where did these mounted warriors come from? That was true. The Arapahos of Little Raven, the Kiowas of Satanta and Lone Wolf, the chiefs and braves of the Comanches and the Apaches—they had heard the battle, they had armed and had mounted and were rallying to the rescue of the Black Kettle village. The Native American Indian Story of Black Kettle's Village provides an opportunity to read about the life and times of Native American Indians and many of their great wars, chiefs and famous leaders. A Classic Short story about Black Kettle's Village for kids and children of all ages. This short story of Black Kettle's Village is great to read to kids and children enabling them to learn about history in a fun way. This very short story contains information about the famous chiefs of Native Indian tribes and their wars, battles and conflicts. This short Native American story has been selected to keep the attention of kids and children of all ages. Read our free short story online about Black Kettle's Village. This free, online short story about the people of famous tribes Native American Indians to increase knowledge and understanding of the indigenous people of North America and the wars and battles they fought. The Story of Black Kettle's Village. Discover the vast selection of pictures which relate to the Stories, History and Culture of Native Americans. The pictures show the clothing, War Paint, weapons and decorations of various Native Indian tribes that can be used as a really useful educational history resource for kids and children of all ages. We have included pictures and videos to accompany the main topic of this section - The Native American story of Black Kettle's Village. The videos on this website enable fast access to the images, paintings and pictures together with information and many historical facts. All of the articles and pages can be accessed via the Native Indian Tribes Index - a great educational resource for kids.